Real Life Assignments: Take cover! In my last post I made the point that photographers have to be ready to make the most of whatever opportunities present themselves and this cover shot is a case in point. 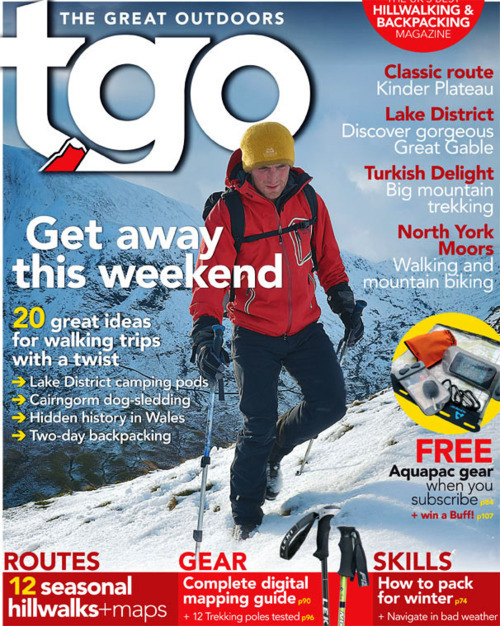 It's the current TGO front cover for March 2012 edition and was shot in December, just days before Christmas. I awoke to a bright, shiny sun filtering through my bedroom skylight which was covered in fluffy white stuff; Snow, and plenty of it. This was not a day for hanging around in the office but I had to do the school run first! On the way back I rang round to see who was at home and willing to come out for a couple of hours to play - but got no answers. It seemed everyone was already out, or working, or away, or asleep??!! I left some messages and resigned myself to getting out anyway and maybe trying a few time-release self portraits or something. On the drive in to Haweswater my mobile rang. Outdoor pro, Paddy Cave to the rescue. Yes he was in, yes he wanted to get out to scope the ice for climbing. I'd drop into his place on the way past and pick him up. Now I had a photo-shoot on my hands. I pack light for this kind of thing. A Nikon D5100 with an 18-200 DX VRII lens and a spare battery is all I take. Plus my either my Manfrotto tripod with RC ball head, or a compact 5-section lightstand with a small ball & socket head to convert the thing into a makeshift tripod if needed. For lighting I pack a small Nikon SB600 with a dome diffuser, my Expro 5-in-1 reflector, my Interfit Strobies soft box and some small pony clamps and my Pocket Wizard triggers; Mini TT1 and Flex TT5. If I packed the D700 instead I could use the Nikon's built-in CLS system for flash triggering through the pop-up flash but the D5100 doesn't have it. This might be a good enough reason to swap the D5100 for the D7000 actually but we'll see. Or maybe I'm more inclined to sell the D5100 complete with the 18-200 DX and get another D700, which I consider to be the most versatile camera on the planet for my needs. When I take the battery pack off it's reasonably small, compact and light enough for hill use and still performs like a D3 - what an amazing camera. Anyway, on this mission it was the little D5100 and so to work. 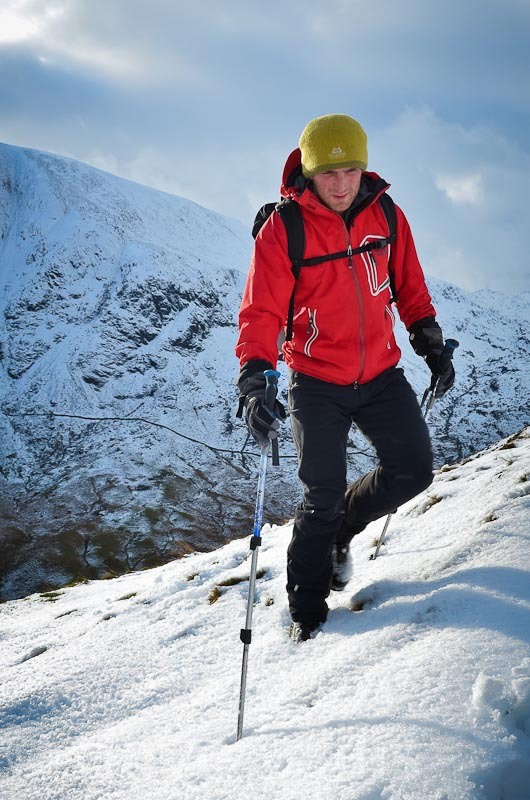 Paddy wanted to check out the ice falls up above Blea Water in Mardale at the head of the Haweswater valley, a reliable place for winter climbing in the Lakes. The walk in via the Riggindale ridge provides heaps of opportunities for winter walking shots with outstanding backgrounds in all directions so that worked fine for me. As we ascended the ridge I started looking out for potential sites for cover shots. What I look for is something I refer to as natural "stages" - places where a figure will stand out alone, uncluttered and separated from the background. That can be a rise, a rock, a hillock or bend in a footpath, even an edge or horizon, anything that might serve as a plinth on which to place my model. In this case I chose the low edge or "horizon line" of the fell against the background. 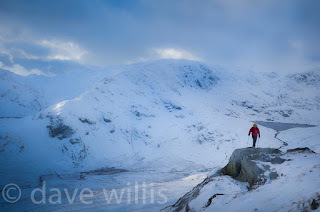 By choosing a very low, almost ground level camera position, I could get Paddy close to the horizon line and use the the two strong diagonal lines of the near and far fells as graphic elements. The sun is helping me here because the background is in shadow while the foreground is in sunlight, so I have a tonal contrast that separates the two - which is nice. If you look at the shadow that Paddy is casting on the ground you can see where the sun is coming from - background left. So, Paddy's face should be in shadow really. The sun isn't very intense though, the shadow it creates is not very dense, not very black. If it was, I would need to use a flash to light him up. But I don't because all that sunlight is bouncing back off the snow and providing enough fill light. We shot a load of interesting images that day, with me all the time looking for little "stages" on which Paddy could perform for the camera. And that is what this is really about - it's a performance, designed to capture an image with just enough reality to look convincingly realistic and yet each situation choreographed and set-up to produce a polished, tidy, professional look. I don't mind that, in fact often I prefer it. I've shot thousands if not tens of thousands of pictures of walkers on the hill in the 30 years I've been doing this. My experience has been that most of the pictures that were carefully constructed would have looked fine on a front cover and most of the ones that were grab shots of passing walkers, in situ, unrehearsed and undirected would not. Front covers don't just happen. They have to be "fit for purpose". They have to fulfill criteria, be a certain shape, a certain format. They need a look that is consistent with the journal they are destined for. They must allow the magazine to stand out from the crowd on the shelf. That's why I choose bright coloured jackets, confident looking models and modern gear. 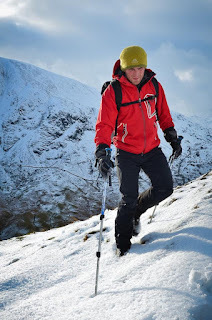 Old bobble hats, mismatched colours and tatty gear is never going to make it. I enjoy the process of designing the photograph. That's how I look at it, I'm designing an image, making a photograph rather than taking a photograph. If I was shooting news, reportage, photo-journalism - as I have done and continue to do - my goal would be different. Then it would be all about realism, integrity, honesty and shooting it as it is. But this is different. This is about creating a picture from nothing. I am free to construct, design, manipulate the situation, the colours, the lighting. When I set out that morning, everything I did was about using the light, the snow conditions and the bright weather to create a photograph that stood a fair chance of making a cover shot.